It’s sort of eerie and quiet around the Genesee area where we farm as all the harvest activity has come to a sudden standstill. With the exception of one or two farmers, most of us have finished harvesting our winter wheat and are waiting for the spring wheat to finish ripening. Farmer Joe finished the last 15 or 20 acres around our house yesterday after the repairs on his combine were completed. He is optimistic that he can harvest the hard red spring wheat beginning on Sunday. Last night the farmer and I went on a date and headed down to Lewiston, and we passed the huge mountain of wheat piled outside the terminal. 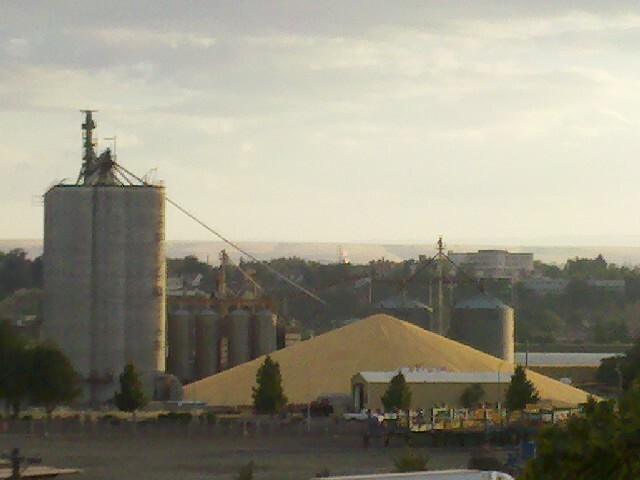 This is a fairly common sight to have the excess piled outside when the terminals get full. The grain will start getting shipped by barge to Portland, Oregon and from there it gets shipped to the Pacific Rim countries, like Japan and the Philippines.